The Minoan language has yet to be deciphered and the main source of information on them is from their frescoes and artifacts. These frescoes give students an unparalleled opportunity to experience being archaeologists. 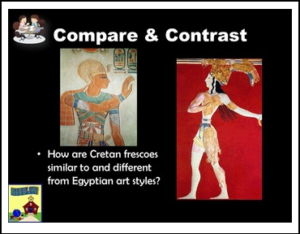 So I put together a series of Minoan frescoes paired with guiding questions to lead the students on a journey of historic discovery. How do their observations stand up to those of archaeologists and historians? Try the sample in your classroom, the complete Minoan presentation is 173 slides and handouts and explores in depth the entire archaeological discovery by Sir Arthur Evans and new information unearthed since then. Your students will love it, and be highly engaged in this style of learning. Features include: slide sorter, laser pointer, digital pen, high lighter, and presenter’s notes. This makes it possible to add or highlight notes directly onto the slides. It is possible to check out these features on the preview, by right clicking on the screen. A tool box will appear so that you can experiment with the various tools. © 2014 SKOOL AID PRODUCTS. This purchase is for you and your classroom. Duplication for an entire school, an entire school system, or for commercial purposes is strictly forbidden. Please have other teachers purchase their own copy. If you are a school or district interested in purchasing several licenses, please contact me for a district-wide quote.